A few weekends ago I was coffee-dating and Anthro-browsing with my real-life/blog-life pal, Megan. We wandered into an olive oil/vinegar shop because Megan mentioned that they had a coconut white balsamic…and, I HAD TO try it. Had to, it happens. So, I tasted the coconut vinegar, and it was so sweet-tart, coconut-y, and delicious…I had to have some. 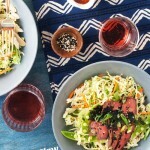 I’ve been daydreaming ways to showcase this vinegar and I kept coming back to fragrant jasmine rice. 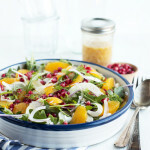 This salad comes together quickly and can be served warm, room temperature, or even cold. The vinaigrette is a savory-sweet and tart mixture of the coconut white balsamic, some persian lime olive oil, a little shallot, and sea salt. 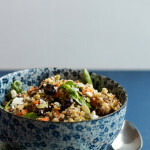 We shake up the vinaigrette in a jar and gently stir it into the still warm rice–for optimum dressing absorption. 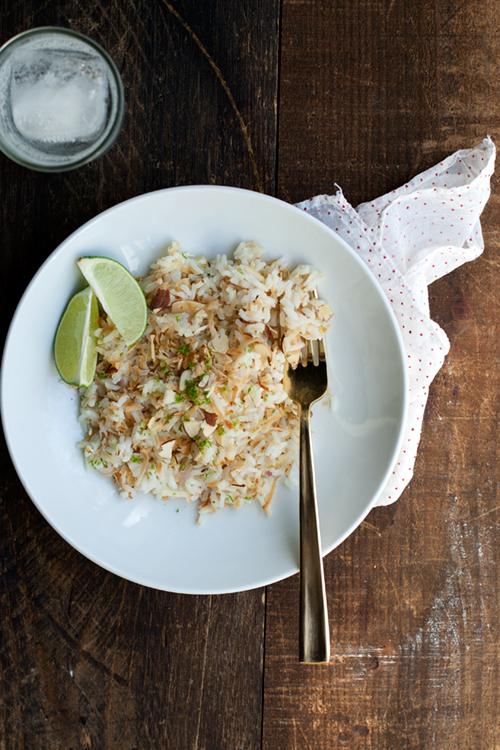 Toasty (unsweetened) coconut, nutty sliced almonds, and super-fragrant lime zest are fluffed into the rice. Every bite has texture and flavor and fragrance. I can’t wait to serve this rice alongside grilled seafood…a late summer evening with a cool glass of something boozy will be a totally optional, yet highly suggested, accompaniments. I know coconut white balsamic and persian lime olive oil aren’t the most readily available pantry staples. You can use any vinegar and olive oil you’d like (I like the idea if rice wine vinegar and a lighter olive oil), just add a little extra lime zest for good measure. For reference, I purchased the oil and vinegar from HERE (the Birmingham location). The man I talked to was super knowledgeable and had great suggestions. PS, I like my dressing/vinaigrettes to be pretty tart and bracing…so, add more olive oil if you prefer a more smooth and lush dressing. Cook the rice. For a rice cooker–follow manufacturer’s instructions. On the stove-top, pour the rice into a medium saucepan add 1 2/3 cups water (I like a ratio of 1 part rice to just under 2 parts water, thus the 2/3 measurement, but if you have a tried and true method, use that). Bring the pot to a boil, reduce to a simmer, and cook, covered tightly, for 15-20 minutes, until the liquid is absorbed. Allow rice to rest, covered, for at least 5 minutes. Scrape the rice into a large mixing bowl and fluff gently with a fork. Set aside. To toast the coconut and almonds, preheat the oven to 350˚F and spread the coconut and almonds on a single layer on a baking sheet. Toast for about 4 minutes, stirring after the first 2 minutes. Watch the coconut and nuts carefully, as they can go from perfectly toasted to burned in a matter of seconds. Set aside to cool. Once cooled, toss with the lime zest and set aside. In a small jar combine the lime juice (about 1 tablespoon total), minced shallot, coconut (or plain) vinegar, lime (or plain) olive oil, and a big pinch of sea salt. Fasten the lid on the jar and shake vigorously to combine. Pour the vinaigrette over the rice and fold gently with a rice paddle or rubber spatula to combine. Add the coconut/almond/lime zest mixture and fold in gently to combine. Serve warm, room temperature, or chilled. That sounds so good!!! Must try the vinegar and oil you mentioned. Sounds Delish! I know Riesling often gets a bad wrap, but this salad in summer+fish just screams dry Riesling to me. Holy heck, I am going to try and find some coconut balsamic now as it sounds dreamy. This sounds like a great combination … and coconut vinegar – I will have to try that one. I love coconut rice! And my mind went straight to where the commenter above’s went: this + fish + white wine in the summer = heaven. I have a weakness for flavored balsamic vingers and coconut sounds devine. 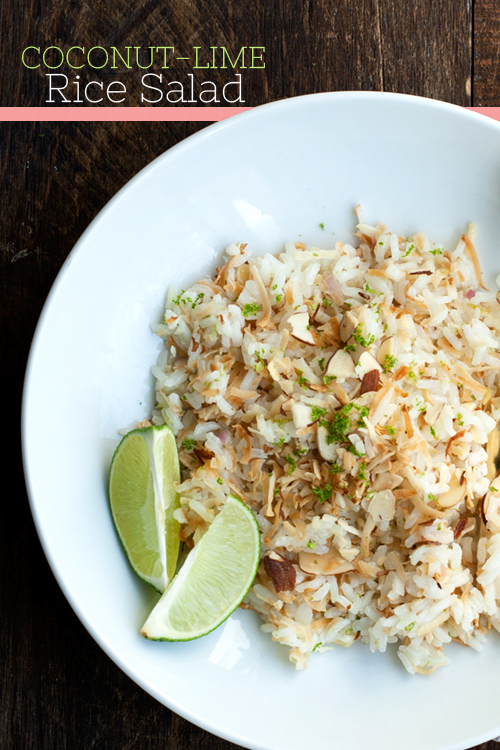 This rice has me dreaming of white sand beaches with a glass of pinot noir in hand. yes! I like that daydream! Go for it! Maybe add a little more lime juice and a bit of honey as well. Yay! Great! I’m so glad, Christina. Thanks for the feedback! Coconut white balsamic and Persian lime olive oil sound pretty incredible! What a clever way to use it, too. Omg. This looks amazing! 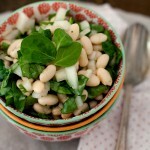 I don’t often get super excited about savory recipes, but I can’t wait to try this!!! Talk about a fantastic combination of flavors. Also, just read your about page and I love your writing style. You are so cool! I share your hatred of raisins. So gross! But I love dried everything else–apricots, dates, cherries, mango, banana…but not mushrooms. yay! Thanks Erika! I’m glad you found me! This looks amazing! What a beautiful blog! I can not wait to try this recipe! AND it’s wheat free what a win! Almond and coconut are by far two of my favourite flavours. Just ordered a Tahiti lime olive oil and a Coconut balsamic vinegar. I was looking online for recipes and ideas of what to cook with it and stumbled upon this. Cant wait to try it! awesome! let me know if you do!! 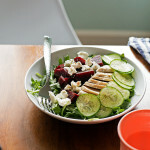 I am very impressed with the wonderful photos you have throughout your blog. 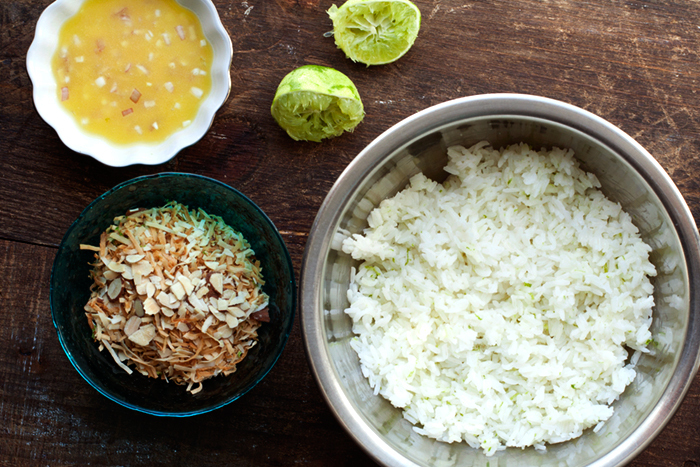 The coconut lime rice salad presentation is the perfect enticement to get readers to “try it.” This would be a perfect start to a dinner for two or a dinner party. 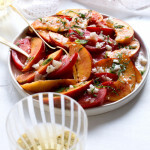 At BigChefOnline.com we make appetizers for any occasion and love passing on great recipes for our customers to try that will add to their event. Thank you for creating something out of the ordinary. Certainly a dish people will remember!